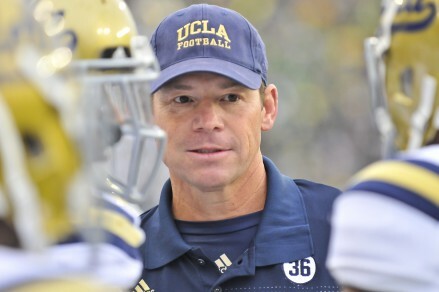 Oregon and UCLA were considered the favorites in their respective PAC-12 divisions going into the 2014 season. Now, a little over a month into the season, the loser of the Saturday contest between the two teams may have to kiss college football playoff aspirations goodbye. As far as the similarities go between these two teams, though, that is just the tip of the iceberg. 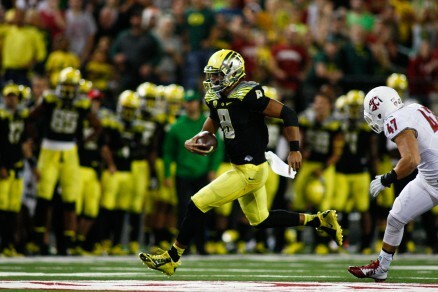 Both teams feature Heisman-caliber, third-year starting quarterbacks in Marcus Mariota and Brett Hundley. Both players have a good chance to get drafted in the first round of the NFL draft, should either decide to leave college after this season. Unfortunately though, neither quarterback is 100 percent healthy. Mariota says his team is “really getting after it” this week. 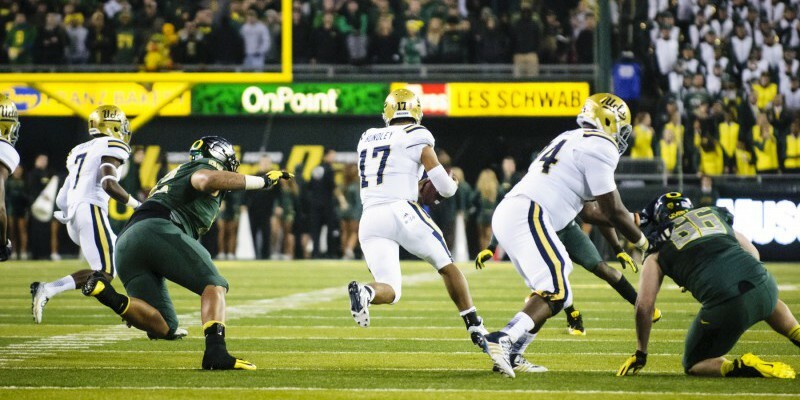 Hundley left the game against Texas on September 13th with an elbow injury and didn’t return. He’s started every game since, and though the injury is on his non-throwing hand, it’s not fully healed. On the other side, Mariota was reportedly banged up going into the game last week against Arizona, according to offensive coordinator Scott Frost. There was some debate about the validity of Frost’s post-game comments, but considering how many hits Mariota has taken this season, it’s not hard to believe his body is beat up. Which leads us to perhaps the most important parallel between Oregon and UCLA going into this Saturday: Their offensive lines struggle. Like Oregon, UCLA is without the starting offensive tackles and has paid a price for it. They’ve also been without guard Alex Redmond since he was injured on September 25th against Arizona State. According to UCLA o-line coach Adrian Klemm, their replacements, Malcolm Bunche and Caleb Benenoch, have “played tackle out of necessity.” Sound familiar? These two teams rank last and second to last in the PAC-12 in sacks allowed, which has caused two previously high-flying, high-scoring offenses to stagnate. By no means has this college football season gone as predicted, especially in the PAC-12. But one thing we know for sure: A one-loss Oregon or UCLA team will be in the conference championship no matter what happens in the rest of the PAC-12. On paper, these two teams are very similar. Their motivations going into the matchup this weekend are very similar as well. It’s hard to say who has the edge this week. Efforts last week were not a good representation of what either team is capable of, especially because neither is playing at full strength. Both teams have a lot to prove and there will be no shortage of motivation on either side. No matter the outcome, this game should easily be one of the most competitive and intense games of the college football season thus far.